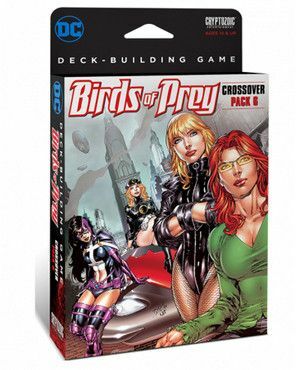 Add this Crossover Pack to any DC Deck Building Game to play as the preeminent all-female covert ops team, Birds of Prey! Founded by Black Canary and Oracle, the Birds of Prey are made up of fierce, intelligent, and brave Super Heroes who operate in the shadows to protect the citizens of Gotham City and beyond. The Birds of Prey have appeared in over 350 comic book issues and continue to be a fanfavorite super team! A brand-new innovation in this expansion is CARD ROTATION. Many effects on the cards, including the Super Heroes, allow players to rotate their cards. This is especially useful with Ongoing cards, of which there are many in this set of various card types. Ongoing cards maintain their rotated status, which is beneficial to players since there are many bonuses simply for controlling rotated cards. Even better: When an Ongoing card with a rotation ability ticks all the way back to upright, a powerful bonus is generated! Make your plans, time your strikes, and the clock will be on your side in this exciting new addition to the DC Deck-Building Game universe!